Species sold by local and online pet stores are not native to Oregon so it is important that you do not release these plants and animals into the environment. 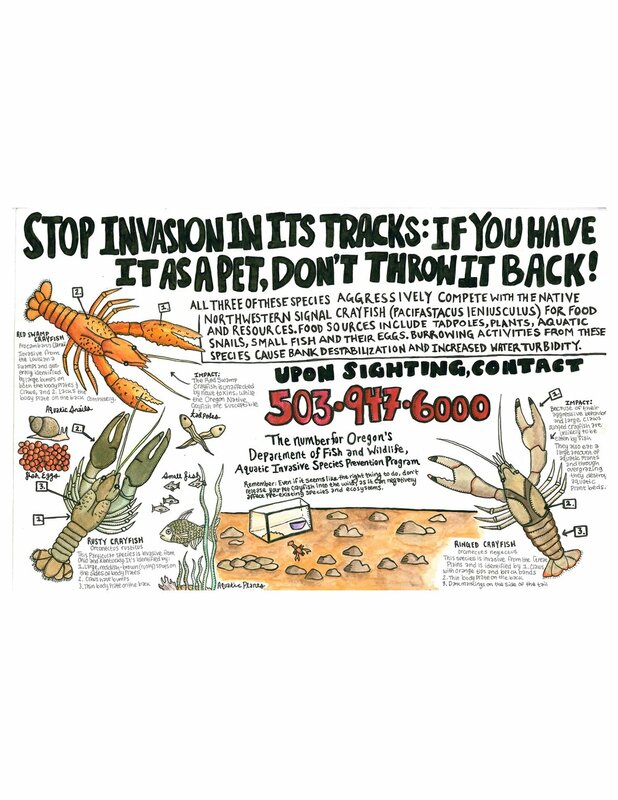 Many can survive and reproduce, becoming invasive quickly and displacing our native fish, wildlife, and plant species. If you have a pet that you no longer can care for, contact your local pet store, veterinary clinic or licensed wildlife rehabilitation facility, or contact the Oregon Department of Fish and Wildlife at (503) 947-6301 or odfw.info@state.or.us. You can also visit the Don’t Let it Loose website to learn more. THE OREGON DEPARTMENT OF FISH & WILDLIFE’S (ODFW) INVASIVE SPECIES COORDINATOR, RICK BOATNER, HOLDS UP A BABY RED-EARED SLIDER ON THE RIGHT, AND A FULL-GROWN ADULT ON THE LEFT, TO ILLUSTRATE JUST HOW BIG THESE CUTE and once little TURTLES CAN GET. NOT TO MENTION THE FACT THEY CAN LIVE UP TO 50 YEARS IN CAPTIVITY. PHOTO FROM ODFW. THE “RED-EARED SLIDER” IS A COMMON PET TURTLE NATIVE TO THE EASTERN U.S. THAT HAS DEVASTATING EFFECTS TO OUR NATIVE TURTLE POPULATIONS. It has a dark shell, yellow stripes on the neck and legs, and a bright red patch just behind the eye. ADOBE STOCK PHOTO. Take your pet to a shelter, sanctuary, humane society, animal refuge and see if they will take it. See if a friend or someone else would be willing to adopt your pet. Use an adoption pledge form where students volunteer to take home the pet, with the understanding of invasive species, promising to not release it into the wild. Have a qualified veterinarian euthanize the animal in a humane manner (last resort). Educate friends, family, students, teachers, etc. Don't let your pet loose! Report sightings of invasive species to 1-866-INVADER. 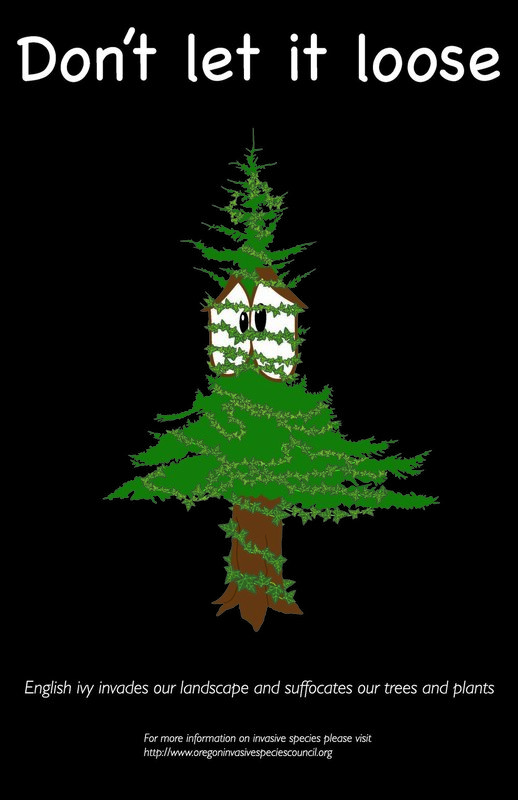 OISC's first high school media contest was held in 2015. Participants were asked to create a poster for the Don't Let It Loose campaign. The following posters were some of the many creative and educational entries submitted by students! 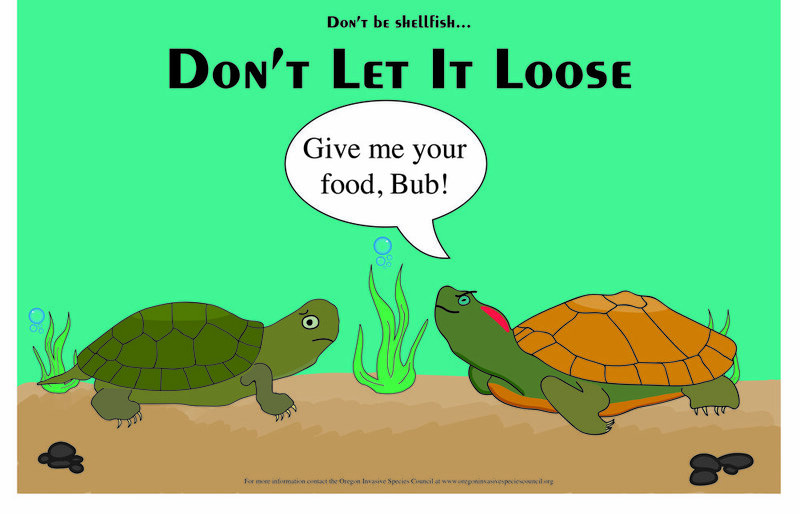 For more information on the Don't Let it Loose campaign, please contact Rick Boatner (rick.j.boatner@state.or.us) at the Oregon Department of Fish & Wildlife (ODFW).